I love your friendly reminder! It is so important to look for joy in everyday life. Great reminder! Isn't that a kind of being happy? To me happiness isn't a monotonous positive feeling, it is the little things and our ability to enjoy those. Love it, and your many reminders! Love this! And needed it today in a big way. A beautiful reminder. Finding joy in the midst of darkness and pain is so hard, but so necessary. Finding delight and happiness in little everyday things helps me to stay in that positive mindset I try hard to cultivate but can’t always maintain. It doesn’t hurt to be reminded as often as we need to be. It’s all too easy to fall back into that rut of grief and loss and what will never be, and it can be a hard climb back up, time and time again. I’m a bit over the top with positivity at the moment – a holiday by the beach will do that to you – looking for shells on the daily beach walk; watching the honeyeaters come in every evening for their fill from the grevilleas by the window; laughing kookaburras waking us up at some ungodly hour of the morning; catching up with an old school friend I’ve known since I was ten; an evening glass of wine or two and the Australian Open or the cricket match on TV. I hope I can help it continue as I get back into my ‘home again’ routine. 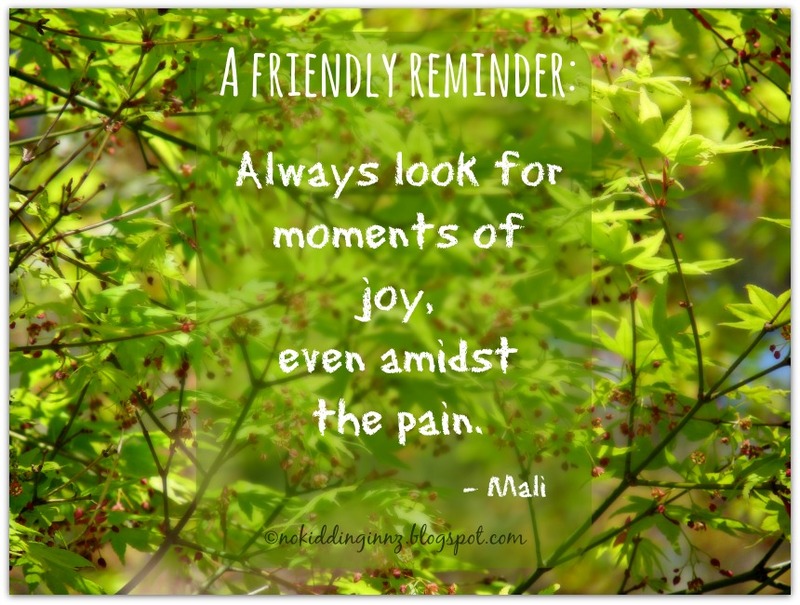 I welcome the repetition -- we all need the reminder -- and I love this: "The joy doesn’t mean the pain isn’t there, or that it goes away never to return." So true. 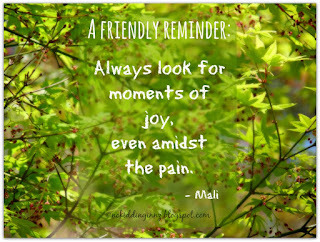 Brings to mind an old Stevie Wonder tune, "Joy Inside My Tears"~ the reminder is most welcome. So lovely - beautiful sentiment and post. I love this! This is what gives us all hope. Love this reminder. And I love the word "joy". So beautifully put! I think those moments are helpful reminders that there can be and will be happier days ahead. That we are not forever stuck in one emotion.